Kim, who earned a Ph.D from Union Theological Seminary in Worship and the Arts in 2013, is now pursuing her academic career as a professor and consultant. Reggie will continue to perform and tour extensively as singer-songwriter, storyteller, and educator, in solo concerts and in some well-chosen friendship collaborations. Kim & Reggie Harris combine a strong folk and gospel legacy with a solid background in classical, rock, jazz and pop music. As socially conscious acoustic musicians and storytellers, the Harrises have been “walking the talk” for over 30 years, performing modern and historical songs that explore societal ills and proffer positive social messages. The Harrises’ cultural background as African-Americans is a major component of their repertoire. Spirituals and gospel songs are liberally incorporated in their work, and they are well respected in scholastic circles for their presentations on black history for teachers and students alike, as Affiliates with the AIE Programming at The Kennedy Center Their best known recording, Steal Away: Songs of the Underground Railroad(1998), is a much-used teaching tool during the annual Black History Month, and serves as the backbone of their “Music and the Underground Railroad” workshop, and is a staple educational aid in many American historical museums. The CD’s sequel, Get On Board! Underground Railroad & Civil Rights Freedom Songs, Volume 2, was released to enthusiastic response in 2008. Yet no one who has seen the married duo of Kim and Reggie Harris in their hundreds of yearly folk-oriented performances, heard their spirited, purposeful CDs, or learned about the Underground Railroad and Black History through their special concerts and teacher training seminars would believe the upbeat couple was simultaneously battling Reggie’s ever-worsening, life-threatening autoimmune disease, which required a new liver. After 13 years, he was running out of time, but in 2008, Reggie was given new life when a liver donor became available. Within months of Reggie’s liver transplant, the duo were back on stage performing together, and they have resumed their busy touring schedule. Reggie’s post-surgery songs can be as calm as a gentle awakening (“A new day is here…You’ve got a new race to run” he sings on the title track). In May, 2013, Dr Kim Harris was awarded her Ph.D. in Liturgy and Music from Union Theological Seminary in NYC, for her research into the role of music from the Black Catholic perspective, including Civil Rights history. Earlier in 2013, her music for a Mass based on African-American Spirituals, a collaboration with Roger Holland, was published by GIA in the new Black Catholic Hymnal. While most of their performances, teaching and research are done as a team, Reggie Harris has taken a leadership position on the board of the Living Legacy Pilgrimage where he has collaborated with a team of Unitarian ministers in leading eight-day intensive bus tours of the 1963 Freedom Riders and Civil Rights historic sites from Birmingham, Alabama, to Memphis, Tennessee and points in between. With every tour group, Reggie gains as much knowledge and inspiration as he shares in his presentations. Let My People Go! presents a memorable analogy in song and spoken word between the story of the Jewish exodus from slavery in Egypt in the 13th Century B.C.E., as retold at the annual Passover Seder meal, and the African American struggle toward equality in America as exemplified by the mid-Sixties Civil Rights Movement, in which many Jewish activists were involved. No preaching, no heavy-handed didactics – this is an uplifting and enlightening celebration of accomplishment through action. Kim and Reggie Harris and Rabbi Jonathan Kligler’s friendship and collaboration dates back 25 years. Their recording “Let My People Go: A Jewish and African American Celebration of Freedom” emerged out of many deep and challenging conversations shared and many songs sung together. Kim and Reggie and Jonathan share the fruits of their friendship in this performance. 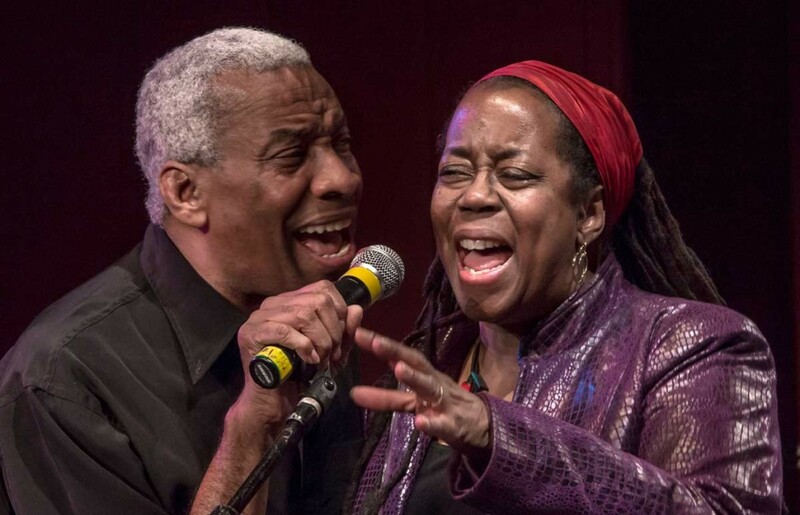 Living in our fragmented world, veteran African American folksinging couple Kim and Reggie Harris have always conveyed a central message in their hundreds of yearly musical performances and educational workshops – we are one! While celebrating our many differences, such as race, religion and nationality, we are all part of humankind and must work toward peace, freedom and understanding through activism, solidarity and faith in the human capacity for goodness. Rabbi Jonathan Kligler has been the spiritual leader of Kehillat Lev Shalem, the Woodstock Jewish Congregation, since 1988. During that time Rabbi Jonathan, as he is called, has overseen the growth of the congregation from a small once-a-month gathering into a thriving Jewish community with 400 member families and thousands of friends and supporters. The synagogue is known throughout the Hudson Valley of New York and beyond for its welcoming and heart-opening atmosphere, innovative and inspiring approach to religious practice, and great music. Kehillat Lev Shalem means The Congregation of a Full Heart, and Rabbi Jonathan has a gift for touching hearts and opening minds in an atmosphere of genuine respect. Rabbi Jonathan is an accomplished singer, song leader and folk guitarist with numerous CDs to his credit. He is also the author of Hineni, a collection of his writings and teachings (Blue Thread Publications, 2013.) Rabbi Jonathan was ordained by the Reconstructionist Rabbinical College in 1989. He lives in Woodstock, New York with his wife Ellen Jahoda, a visual artist, and their two daughters. From Solstice to Chanukah to Christmas to Kwanzaa, many cultures and peoples celebrate as the days grow short in the Northern Hemisphere. These gatherings are a reminder of the changing season, of hope and freedom, of new life and new beginnings and of the basic principles for living together. Combining their many talents, Kim & Reggie Harris and Magpie perform music and share stories from these various traditions that mark The Season of Light. Celebrating the many common themes these festivals bring into focus: the changing seasons, respect for nature, the quest for freedom, kindness to others, unity, cooperation, purpose and creativity. Kim and Reggie Harris have been affiliated with the John F Kennedy Center’s Partners in Education program for over two decades, offering multimedia performances for students and community, and in-depth workshops for educators at all grade levels. Touring, writing, researching and recording together for over 30 years, Kim and Reggie have amassed an amazing repertoire of African American music, blending spirituals and freedom songs, the old and the new. Mentored early on by Dr. Charles Blockson, they set out to raise awareness of the Underground Railroad, using music and history to create an engaging performance for audiences of all ages, from the young school audiences to college symposium and adult concerts. Performances and Teacher In-Service presentations developed in collaboration with the Kennedy Center Partners in Education program. The fact and legend of the Underground Railroad is one of the most memorable chapters in American History. Music and the Underground Railroad, a concert of songs, stories and narratives about slavery and the quest for freedom reveals the hope, the power and eventually the triumph shared by a network of people of many races. Through sing-a-longs, audience involvement and a multi-media presentation Music and the Underground Railroad provides an understanding of the secrets and passion of this powerful era. The stories of people such as Harriet Tubman and Dr. Martin Luther King, Jr. have become a familiar part of the study of American History. The works of many other significant African-Americans from every walk of live and field of endeavor are not as well known. Dream Alive!, a multi-media presentation, will bring to light the heroes and sheroes: artists, educators, inventors, explorers, scientists, poets and other important contributors to the life and culture of America and the world. One Family/One Planet is a fun, entertaining and thoughtful look at some of the topics that are in the news and on the minds of people all over the world. In songs, stories, play-action and with audience involvement Kim and Reggie explore the world of garbage, take a new look at friendships, consider our resources and celebrate the diversity that makes the earth such a wonderful home. Kim and Reggie Harris offer a “hands on – classroom ready” historical and musical workshop on the Underground Railroad. Teachers receive valuable tools for building the knowledge base of students through effective art based curriculum connected lessons designed to open classroom study to a more vibrant exploration of history, music and language. Copies of their highly praised CD and an extensive teaching guide are included. In this upbeat workshop Kim and Reggie Harris share ways to teach about the history of African-Americans’s struggle for equal rights. Explore how music and storytelling can be used to extend students understanding of the freedom movement, from the Underground Railroad through the modern Civil Rights era. Kim and Reggie Harris will present through song and story the accomplishments of African-Americans such as Rosa Parks, Benjamin Bannecker, Sojourner Truth, Rev. Dr. Martin Luther King, Jr. and others. Explore activities that use songs to extend students learning about the heroes, artists, poets, inventors and actors who have contributed to the life and culture of America and the world. If you have a more general inquiry, please visit our “Contact Us” page.